This is the finished Tuxedo Vest that prompted my new resolution about never being lazy about third grade level math again. Yeah, right. Anyway, it's also my second attempt at merging different patterns. 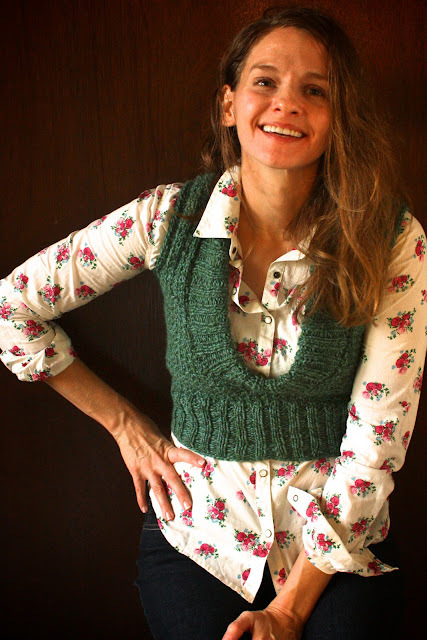 I used the waffle stitch and yarn type from Stefanie Japel's Back to School Vest, but followed the circular version of this Wendy Bernard vest. I guess this was a compromise because I only had enough yarn to make the tuxedo version, but really liked the thermal look of the waffle stitch. and I had just enough Cascade 220 Quatro to finish it. I think my whole family breathed a sigh of relief with me, because there's nothing worse than sharing the couch on movie night with a frustrated knitter. This was only two skeins, people! Two measly skeins, for crying out loud. There really should be some sort of trumpet blast inserted right here... but oh well. It was definitely worth the first failed attempt. First up- I had to research waffle stitch a little as there are different ways to do it. 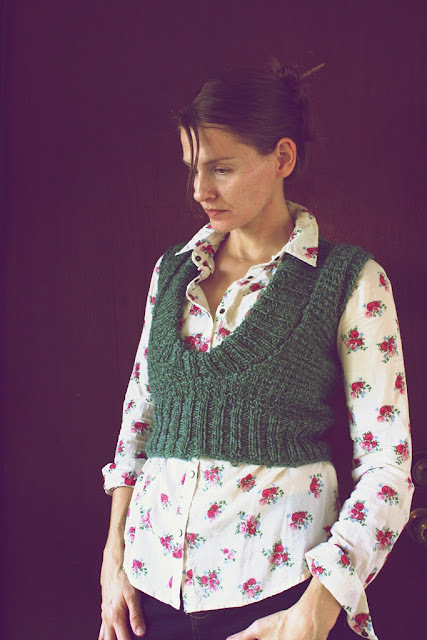 But, basically, it's 2 rows of stockinette followed by a row of k1,p1, repeated to end. I made it according to the smallest measurements in Wendy's pattern with my gauge being 4 stitches per inch/ 6.5 rows per inch. It's worked straight on circulars until almost to the ribbing, where it's joined in the round to finish. 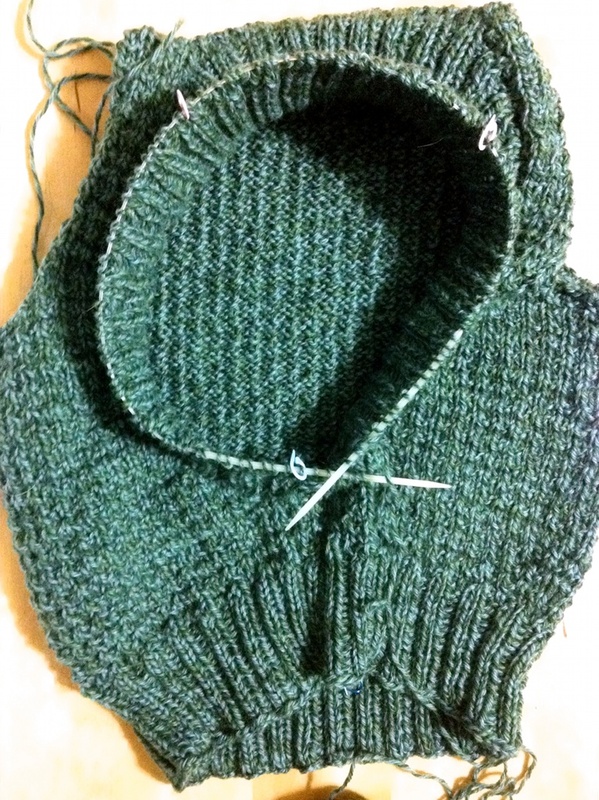 The collar and armhole edging are added afterward by picking up stitches. For the Back: I cast on 48 stitches on size 5 circulars and worked waffle stitch for 6.5 inches, then followed pattern instructions for increases on back. For Front: I unraveled only 9 stitches on each end of provisional cast on, then followed instructions for armhole shaping as with back. After working these pieces together (but not joining them in the front to work in round.) 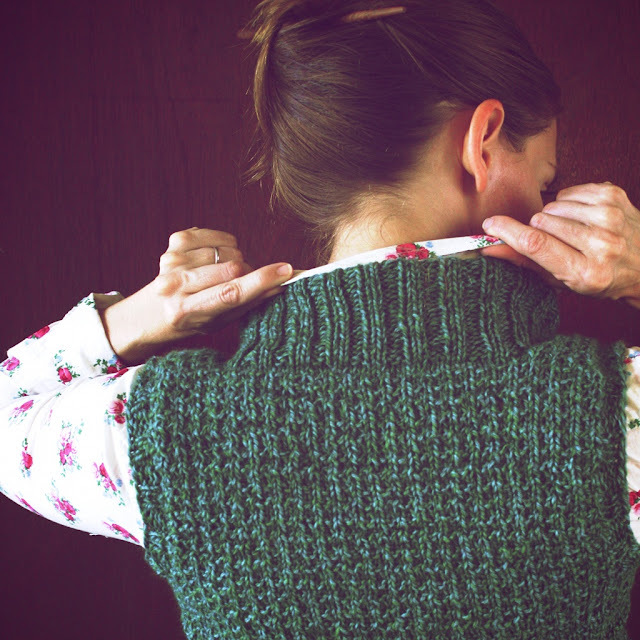 I worked the sweater back and forth as if on straight needles in waffle stitch for 2 inches before shaping neck. Neck: (RS) I increased this and every 4th row 3 times. (WS) work one row even. (RS) Increase every other row 5 times. On this round I made sure my stitches were divisible by 4 and began by joining sweater at front, placing a marker there for beginning of round. Shaping the waist: On this same joining round I decreased 4 stitches evenly at sides of sweater on this row and then every third row 3 more times. (I just fiddled with waffle stitch for side decreases example: ssk, p1,sm,k1,p2 tog), purling some together or knitting, depending on the stitch needed to continue the stitch pattern once the decrease was finished. 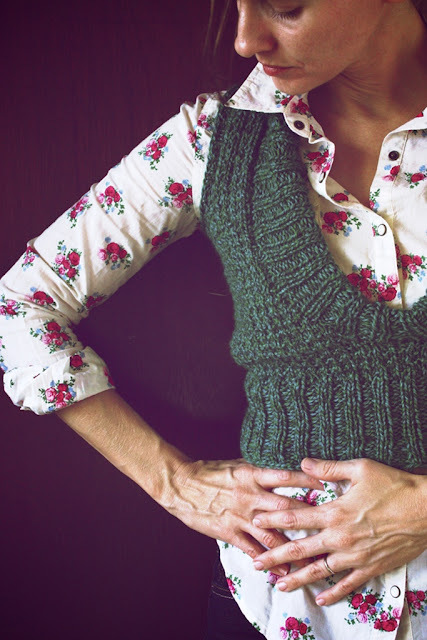 I chose to decrease on the k1,p1 rows of the waffle stitch because they blended in smoothly. 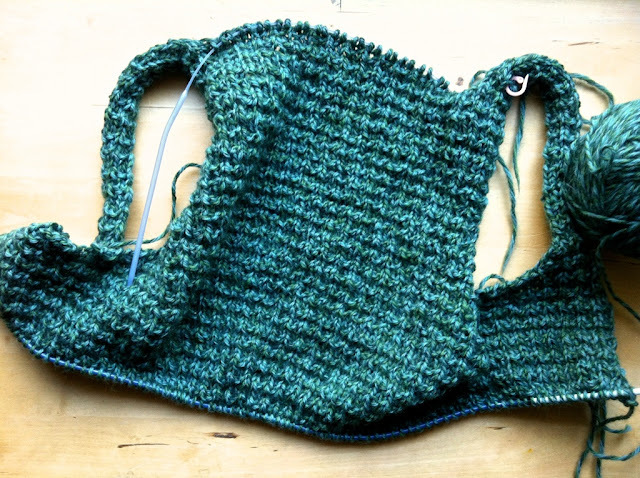 After waist shaping, I had 116 st.
Bottom Ribbing: At this point, the piece was over 16" long, so I changed to size 4 circulars and began regular old 2x2 rib stitch. I knit tightly and worked the ribbing for almost 4 inches, binding off not too loosely. 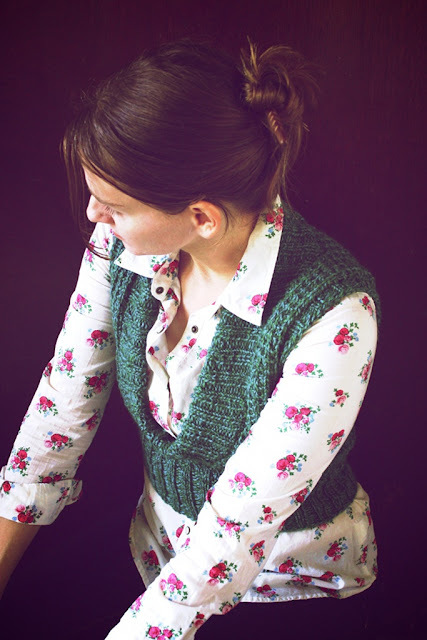 The Collar: The collar is worked by picking up stitches (a number divisible by 4) and working with short rows until the center back was almost 6 inches long. It's then turned under and tacked to stay in place. 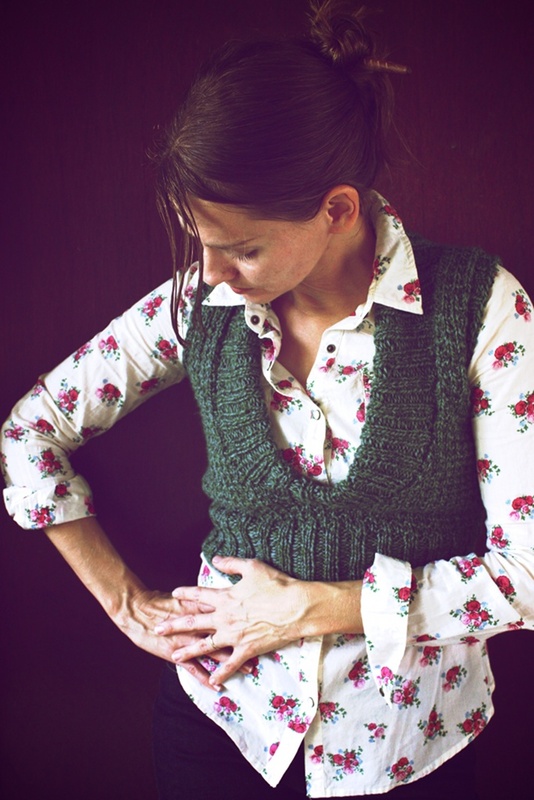 Arm Edging: I picked up 52 stitches per armhole. (That's about one for each stitch at bottom of armhole and one for every third row along sides.) These had to be bound off very loosely. I learned and/or got to practice provisional cast on, waffle stitch, spit splicing for breaks in the yarn- yum, short rows for collar shaping, and tacking down the collar with needle and thread. This is where I give myself a very exaggerated pat on the head. I like this. A lot. It's very wearable, good for the holidays, etc. It may save me from yoga pants and oversized t-shirts. It even makes jeans seam special. But, yes, as soon as I took these pictures, I was right back in the old yoga pants and t-shirt. I just love this! Wonderful job Michelle! Thank you, Jennifer. 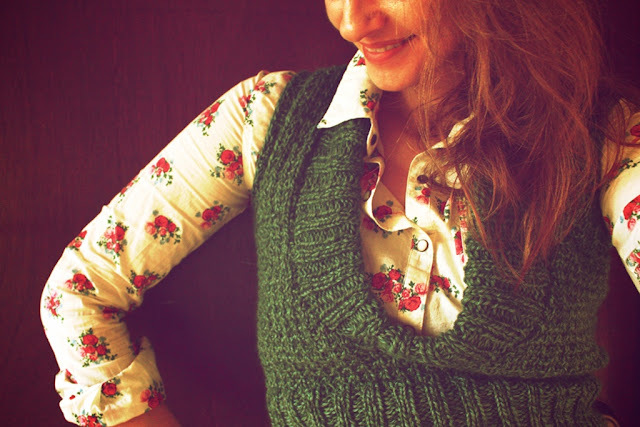 It was really a quick knit once I figured out what I wanted to do. And you can't beat a 2 skein project.